Lindsay Vears was born in Gloucester in 1882, the eldest son of A W Vears, popularly known as “The Commodore”, who was Chairman of both Gloucester (Rugby) Football Club and the Gloucester Football and Athletic Ground Co Ltd. As a boy, Lindsay lived at Brunswick Square, Gloucester, and attended the Crypt School, By 1901 he was working as a Timber Merchant’s Clerk, probably employed by his father, who was a Timber Merchant. 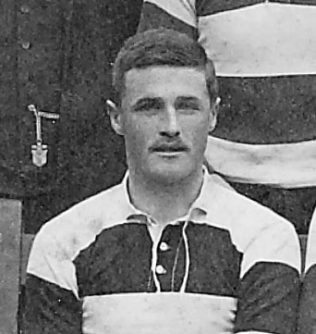 Lindsay played junior rugby for Old Cryptians and Gordon Wanderers, before joining the Gloucester Club during the 1901-02 season. He made 3 appearances for the “A” team, kicking 2 conversions in the 10-9 win at Bream on 31st March 1902 in the penultimate game of the season, and converting his own try in the 5-0 win at Chepstow on 12th April in the final game. This form earned him a place in the 1st XV before their season finished – he made his debut on 17th April 1902, and contributed a try and 2 conversions to the 28-0 win against Cheltenham at Kingsholm. 1903-04 saw Lindsay play in 22 of Gloucester’s 34 fixtures, and he contributed 26 points (6 tries and 4 conversions). His tries were scored against Old Edwardians, Cheltenham, Old Merchant Taylors, Cardiff, London Welsh and Penarth. At the end of the season, WB opined that “A Hudson and L Vears were given lengthy trials on the left wing, but neither quite fulfilled expectations. Hudson went clean off his form and dropped out of the team, but towards the end Vears was going strongly, and both against London Welsh and Penarth he showed capital form”. When Arthur Hudson’s subsequent brilliant rugby career is considered, it is a feather in Lindsay’s cap that he compared so well at this stage. From this time on, business commitments prevented Lindsay from staking a claim to a regular place in the team, although the Club were pleased to continue to pick him when he was available, and he made single figure numbers of appearances for both 1st and “A” teams for the next four seasons. In 1904-05, he scored 2 tries against Old Edwardians in the first match of the season, but played in only four more 1st XV games, and his only other try came late in the season against Stroud. As WB put it “ L Vears, owing to business calls, practically retired from the game, but he filled a vacancy occasionally with every success”. In 1905-06, he made 9 appearances and scored 46 points (11 tries, 5 conversions and one penalty). This included the biggest game of Lindsay’s career – 5 days before Gloucester were due to play New Zealand at Kingsholm, they played at Northampton, and George Romans was injured. Lindsay was therefore brought into the team to play against the All Blacks on 19th October 1905. He spent the afternoon facing waves of black jerseys, as New Zealand stormed to a 44-0 win, and had little chance to attack. WB summarised his efforts as “considering the little football L Vears has had this season, and the fact that he was playing out of his proper position, he performed very creditably.” Later in the season, Lindsay scored tries against Stroud (2), Clifton (2), and Lydney, before playing the game of his career against Plymouth at Kingsholm on 17th March 1906. Gloucester won 71-0, with Lindsay scoring 6 tries. This result contributed to Gloucester breaking their season’s points scoring record with 661. Lindsay’s tries were reported as follows: “The City went close to the line with good work, and the ball coming out from Wood, an exchange of passes gave L Vears an easy try….Stephens whipped out a wide pass, and after some exchanges between Hall, Harrison and L Vears, the latter dashed over in the corner with a splendid try….following a long throw-out by Johns the ball reached L Vears, who, with another splendid dash, scored his third try….the kick enabled Plymouth to reach the home 25, but here the City backs got off with a superb movement. Hall cut through grandly and sent out a pass to Vears, who took the leather cleverly, and with a grand dash apparently scored in the corner. A touch-in-goal, however, was given….Vears was easily put in by Harrison….L Vears next made a capital run….before the nd Harrison, Hall and L Vears added further tries.” In the second half it is apparent that WB had lost interest in the contest, and hardly thought it warranted reporting, summarising the mismatch as “We have had some farcical games at Kingsholm this season, but to-day’s match capped everything. The visitors were of a class associated with a local side, and poor at that, and never had a look in. Gloucester scored 17 tries in all, but quite a dozen scores were missed by forward passes with practically no one to beat.” Lindsay earned a further plaudit from WB at the end of the season – “L Vears rendered most efficient aid as reserve three-quarter”. In 1906-07, Lindsay manged only 4 games and a solitary try in a 10-3 win at Stroud, in an infamous match, which WB described as “a most unpleasant game. Stroud realising their ground record was gone played very rough, four players being ordered off, C.Smith and B.Andrews (Stroud), Pegler and Parham (Gloucester). As a result of the unpleasantness, the committee cancelled further fixtures with Stroud.” WB was still glad to see Lindsay play albeit very infrequently – “L Vears rendered occasional help”. But he did not appear at all in 1907-08. In 1908-09, he made 3 appearances in what was to prove to be his final season with the Club. He added 3 more tries as well – two against Coventry when Gloucester won 14-0, and one in the Boxing Day fixture against Old Merchant Taylors when Gloucester won 14-13. His last game for the Club was against Swansea at Kingsholm on 6th March 1909. Lindsay thus finished his Gloucester career with 61 appearances and 119 points from 28 tries, 16 conversions and 1 penalty. Lindsay had been a part-time soldier in Gloucester with the Royal Gloucestershire Hussars, and he continued his military career with the Malay State Volunteers. When war was declared in 1914 the British Government sent a request to the Malay States for any potential officer recruits and Lindsay immediately returned to Britain and took up a commission in an Indian Cavalry Regiment. He subsequently served as a Lieutenant in the Royal Field Artillery. In 1918, Temporary Lieutenant Vears relinquished his commission on account of ill health due to wounds received whilst on active service; he was granted the honorary rank of Lieutenant. In 1934, Lindsay and the Sultan of Perak starred in a film about a scientific expedition to the remote jungles of the Malayan Peninsula. Lindsay was a playing member of the Iskandar Polo Club and in 1937 was serving on the committee of the Malayan Polo Association. In 1939 Lindsay re-joined the army and was Garrison Adjutant at the Fortress on Penang Island, Singapore when it was over-run by the Japanese Army. He spent the rest of the war in a Japanese Prisoner of War camp. In 1946 he relinquished his command on account of his disability and was granted the honorary rank of Lieutenant. At age 71, Lindsay, now given the rank of Major, was invited to attend the Coronation of Queen Elizabeth II on 2 June 1952; the newspapers reported that he was attending his fourth Coronation having previously been present at those of Edward VII (1902), George V (1911) and George VI (1937). Lindsay died at the Hotel Metropole, Penang, Malaysia, on 21st February 1963.
it’s nice to know more about a member of our family on the English side. When I was a child my mother would talk about her uncle who lived in Malaysia and I have heard little else except for one of my cousins telling me he was a big fan of horse racing.